Fear in the cinema is my special field, and I have, perhaps dogmatically, but I think with good cause, split cinematic fear into two broad categories – terror and suspense. Walking down a dimly lighted street in the late hours of the night, with no other people about, a person may find his mind playing strange tricks. The silence, the loneliness, and the gloom may set the scene for fear. Suddenly a dark form thrusts itself before the lonely walker. Terror. It does not matter that the form was a waving branch, a newspaper picked up by a gust of wind, or simply an oddly shaped shadow unexpectedly coming into view. Whatever it was, it produced its moment of terror. The same walker, on the same dark street, might have no inclination toward fear. The sound of footsteps coming from somewhere behind might cause the late stroller to become curious, then uneasy, then fearful. The walker stops, the footsteps are not heard; the pace is increased, so also the tempo of the thin sounds coming out of the night. Suspense. The echo of his own steps? Probably. But suspense. 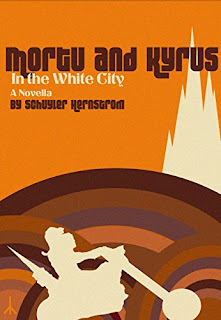 Over at Bushi SF/F, PC Bushi reintroduces a quiet but audacious SF writer from the past, Cordwainer Smith. In “The Crime and the Glory of Commander Suzdal,” the titular commander is suckered by a false distress signal broadcast by a twisted, deviant branch of humanity. The miserable people, colonists to the stars of ages past, encountered a world fatal to females. Determined to survive, the world’s women were scientifically transformed into men. A sick and demented civilization developed, fostering an insane hate for women and for normal humans. Ensnared by these monsters, Suzdal deploys a “life bomb” to a nearby moon along with a number of genetically modified cats, which he has programmed to serve mankind. The kicker – he uses a time travel device to send them back millions of years, to give them time to evolve. Up come their ships from the moon, and the cat people engage Suzdal’s attackers, allowing him to escape. PC Bushi summaries Smith's life and three more stories, each wildly strange in ways unimagined by the codification of tropes and convention. Learn more about Cordwainer Smith at Bushi SF/F and then read a mindboggling story or two. Tired of sitting out the war on Psydon in a mobile office hab, Legion Lieutenant Washam agrees to undertake a covert and unsanctioned mission with a band of Republic Recon Marines. Inserted deep behind enemy lines, the strike force uncovers a surprise key to ending a bitter war. Now they must navigate a hostile jungle teeming with murderous alien rebels, pushing themselves to the limits of their abilities, to get this vital intel to Legion Command--if they can survive that long. With Order of the Centurion, Galaxy's Edge begins its third series of books, dealing with standalone stories of Medal of Honor-level valor--and survival rates. If the main series is Anspach and Cole's take on the Clone Wars, this is their Rogue One. And after two disappointing Tyrus Rexs/Rechs bounty hunter books (the spelling tends to change with the author), the return to infantry combat is welcome. At their best, Anspach and Cole are the best straight infantry military science fiction writers out there, with a cinematic style unencumbered by the all too commonly expected digressions into strategy and why-we-fight motivations. Sure, Wash's personal motivations are explored, but we are not treated to yet more lessons in History and Moral Philosophy by Jean Dubois. The action is excellent, the description is choke-on-the-dust vivid, and the camaraderie is true. Anspach and Cole set aside their literary flourishes and experiments for what is essentially a timeless war movie set in the Galaxy's Edge universe. It would not be a surprise to learn that this novel was optioned for a screenplay in the near future. That said, this is also the least Galaxy's Edge to date, with only a gloss of science fiction over the well-known tale of heroism from a unit that stumbled into more than it could handle. 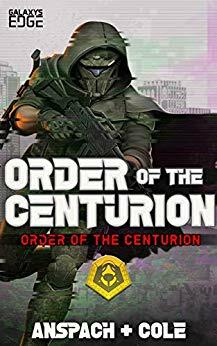 If you like your war movies like We Were Soldiers and Black Hawk Down, you need to read Order of the Centurion. I've been on vacation for a couple weeks, and while I've read a lot, I've also let my reading pile build on me. So, at least for the review portion, I'm going to clear my list, one story at a time, before branching out into new stories. Finishing these reviews will keep me busy for a while. A little accountability never hurts, so if there's something that catches your eye, please ask me about it. At his blog, Misha Burnett proposes a new award for short fiction. Please take a look at the full details and comment over at his site. Overview: In the interests of promoting independently published short fiction I am proposing the creation of an juried award for short fiction. The purpose of the award would be to showcase the best short fiction of the year, as determined by a panel composed of small press editors. Notes And Cautions: I am not an administrator nor a publisher. I have no idea how to judge the feasibility of this idea. I have no idea of how to fund this project, nor even of a ballpark figure of how much would need to be raised. I am putting this out there in the hopes that people who do have the necessary skills will come forward. If they don’t, then it won’t happen. 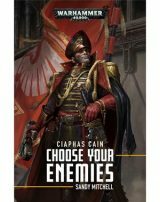 Commissar Ciaphas Cain, Hero of the Imperium, returns in Choose Your Enemies, his eleventh adventure for Warhammer 40,000's Black Library imprint. While on a posting to a remote mining planet, Ciaphas Cain and the 597th Valhallan Regiment unearth a hedonistic Chaos cult. But rooting out the corruption soon takes them to the heavily populated industrial world of Ironfound--and in the direct path of an Eldar raiding fleet. Will elven space pirates, Chaos demons, and crazed cultists finally prove to be too much for Cain? It's been five years since the last Ciaphas Cain adventure, and, while more Cain is always welcome, the Hero of the Imperium is missing that Flashman scoundrel aspect of his nature that adds depth to his more noblebright adventures in the grim dark future of Warhammer 40,000. What's left is a standard military mystery, enlivened by the narrator's footnotes, if not her antics on stage. It's Cain lite, which is still better than most military-flavored SF, just not at Black Library's prices. Hopefully further adventures will take Cain into the upheaval of the new setting in Warhammer 40,000. In the first volume of The Rising of the Shield Hero light novel, Naofumi Iwatani discovers a mysterious tome in a library that, when read, takes him to another world. As the Shield Hero, he must join forces with other legendary heroes to defend this new world. However, he is soon slandered and betrayed by a princess of the realm. Forced into penury, Naofumi must rely on his own wits to grow stronger, for the only way home is by saving the ungrateful world he is trapped in. Even if it takes some unsavory measures. Let's face it, contemporary light novels have not fared well in Castalia House reviews. For every title reviewed, two others don't make the cut. And at first glance, Shield Hero appears destined to join those rejected titles. After all, isekai revenge fantasies usually follow the same script into psychopathic wish fulfillment, especially those based around litRPG mechanics. Naofumi's journey, however, follows a different path, one critical of the standard isekai hero. He is gifted with a useless weapon before falling victim to court machinations that most heroes merely handwave their way through. To survive, Naofumi resorts to unscrupulous measures--including outright slavery--that proves that he does indeed merit the harsh treatment he deserves from his host nation. Consistently forced into disadvantageous positions, Naofumi must figure out how to solve problems and win fights without the blessings that his fellow heroes have learned to enjoy. And when Naofumi eventually wins the day when his more gamer-minded fellow heroes cannot, it only earns him suspicion and jealousy instead of praise. 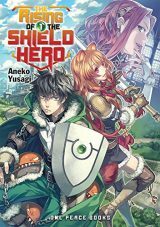 Shield Hero follows Naofumi into some dark places without devolving into venom, diatribe, or secret king preening, creating something unique for isekai, an anti-hero that is not a loser out for revenge.